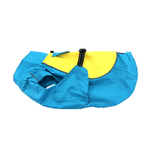 Keep your pup protected from wet weather with the Dog Raincoat Body Wrap by Doggie Design in Teal and Yellow. 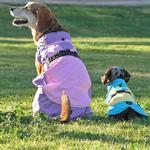 Dog Raincoat Body Wrap by Doggie Design - Blue and Yellow Customer Photos - Send us your photo! Calvin loves to stay in his wrap raincoat! Loves a walk anytime! 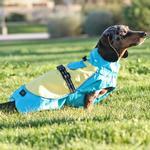 This coat’s design is the best I’ve ever seen for a raincoat! It’s rear leg elastic straps ensure the back of the coat stays down & wrapped underneath your dog for excellent water proofing!! ?? it & my dog will too!! My puppy looks absolutely adorable with this raincoat on. He gets a ton of compliments when he wears this. The raincoat fits him perfectly. Good quality & material to keep him dry. Great buy! This raincoat provides a longer length and more coverage underneath for my dog who is built low to the ground and loves staying out in the rain. Hopefully this works well during spring, summer, and fall rains:) The color is nice as is the material and it is easy to put on and take off. Posted On 01/19/19 by Roberta C from Myrtle Beach, SC Yes, Roberta C recommends this product! Posted On 01/07/19 by Concord from Concord, MI Yes, Concord recommends this product! I got 2 of these rain coats. I have one dog that hates going out when it is wet. He will wait for all day just so he does not have to deal with the wet. He is much more willing to go out to do his business with the coat to cover him. Now he needs a rain hat! My dog insist each time he goes out in the rain or snow that we have to wipe him off. This should solve the problem other than his feet. I like this rain coat better than my other one because it's very easy to put on. It's cute too.